Material：Can fill pad, neck pillow, plush toy etc. 1. 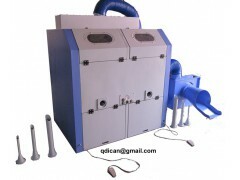 Machine used for opened fiber transport and blowing into toy skin. 2. Stuffing machine also can fill pad, pet bed, neck pillow etc. 3. Filling nozzles can be changed, meet different size soft toy filling need. 4. Save labor cost, save about 10-20 labor by hand. 5. Filling control by foot pedal. 6. Electricity key parts adopt world famous brand, durable and easy to get local support. 7. Main structure of machine made by computerized laser cutting machine, durable.